Solar panel cell prices are predictably falling, by 20% each ten-year period, as indicated by The Swanson effect (see below graph), founded on Swanson’s Law. Prices for solar panels have fallen to a mere $0.36 per watt in 2014, a huge difference from the astronomical $76.67 per watt back in 1977. These drastically lower solar cell costs have brought buying solar into the realm of possible for most people but it can still be a substantial investment of up to $20,000 for a 5kW solar panel system. Figuring out how to fund a solar energy system can be confusing for someone new to the topic of solar power. This is primarily because every state, across the United States, gets to create its own rules and mandates in regards to installation of solar energy system and what kind of rebates and credits are offered for making the transition. In the graph above, you can see your return on investment on solar panels over a twenty-five-year period whether you decide to pay with cash or use a loan to purchase a system. Your ROI if you pay for a system with cash is represented by the green bars and indicates that the payback period for your system is at year 14. Your total profit at the end of the 25-year warranty period is more than $16,000. That’s a pretty decent return on your initial investment. 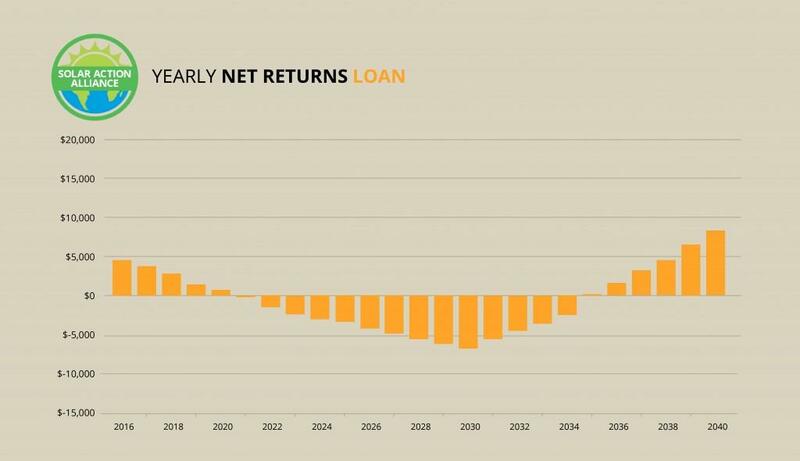 Next take a look at the results of using a HELOC or Home Equity Line of Credit to purchase your solar energy system as represented by the orange bars in the graph above. It’s a zero down investment and at the end of the first year you come out ahead thanks to the 30% federal tax credit. Once your loan is paid off, savings in energy start building up very fast. By the end of the twenty-five period, you end up ahead by thousands. There’s no option to lease a solar power system in Virginia, so a third alternative if you want to switch to solar is to use a HELOC to do it, even if you have only a little equity. Go for a smaller 2kW solar energy system instead. The amount of the HELOC loan you need is lower and you still help the planet by decreasing CO2, and you save thousands over time. Virginia doesn’t allow the option of leasing your solar system from a company, so let’s look at how the numbers break down if you secure a small 2-kW solar energy system for your roof using a loan. You don’t need to have a bunch of cash for an up-front purchase or a large amount of equity needed for a full size solar loan. The cost of a 2-kW solar power system for your roof is about $7,438 installed after the rebate you get at purchase. If you can secure a HELOC or home equity line of credit for that much at 5% interest or lower with a 15-year term, you can still make out pretty well. With a small loan your payments for the year will total about $706 but you will save $300 in electricity operation costs in year one. So you are $406 in the red, but at the year’s end, you reap the benefit of that 30% tax credit on the purchase of your system. So after that first year, you put $1,825 in your pocket. Your monthly loan amount will be about $33 higher than your electric bill was but once that 15-year term is up, you rake in up to $500 savings annually at least until the end of the 25-year warranty on your system. That’s a total of just over $3,000 without putting any money down up front. For those who want to make the switch to solar and retain the majority of control over the system, purchasing the system with cash up front get those solar panels onto your roof under your control but isn’t really the best alternative if you’re looking for the best return on investment. With a cash purchase though, the solar energy system is yours from the first day and you pull in all the rewards that go with it along with pretty good savings on your electricity bill. Let’s look at numbers. The total cost of a 5kW solar panel power system installation is approximately $18,750. At the end of year 1 you can take 30% of expenses as a tax credit on your federal tax return so that’s $5,625 back to you. If for some reason you owe less than $5,625 for federal taxes, you can claim the credit two years in a row. After first year energy savings of $749, the total cost that first year is down to only $12,376. The energy savings start rolling in and after 14 years, your system has paid you back that initial investment. 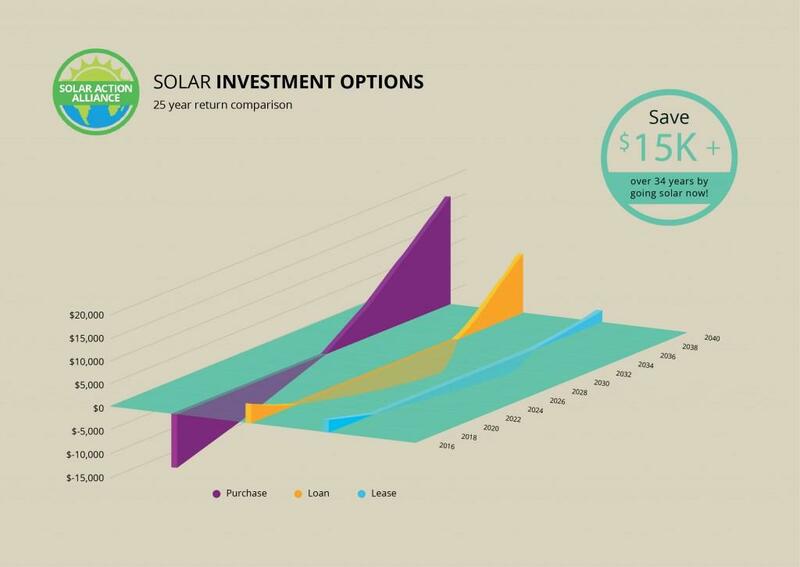 Over the twenty-five-year warranty period of your solar energy system, you bring in a profit of $16,041 which is a 6.8% internal return rate. Anticipated savings in electricity over twenty years adds $14,976 in value to your home and you are reducing your carbon footprint by using clean energy. Pretty good but let’s look at one more option. Virginia gets a fair amount of sun throughout the year which is sufficient to make an investment in solar power a worthy endeavor without taking large incentives into account. If you have a good amount of equity in your home, using a loan or HELOC to purchase your solar energy system is really an easy way to invest in something that will earn nice money for you over time. The HELOC loan is basically a zero down alternative but at the end of the first year you still reap the reward of that tax credit at the federal level as if you had laid out the $18,750 to buy the 5kW system. This puts you in the black almost $4,600 after the first year. After that, your loan amount will actually be about $88 more per month than what your electric utility bill would have been but consider this a type of savings account where you contribute monthly. After the first 14 years, that loan is paid for and now that solar panel system is raking you in the money. You now own the system outright and all those savings end up directly in your pocket! 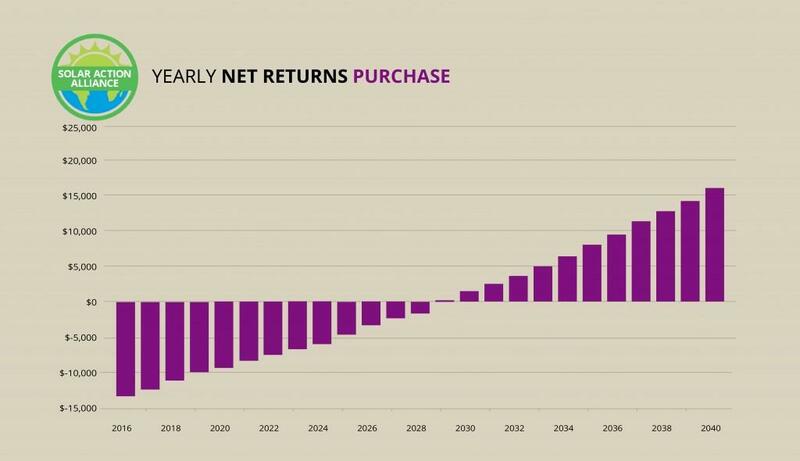 After a twenty-five-year period, you end up $8,101 ahead, not bad for a zero down investment. If you have been paying attention at all to solar panel usage, you may think it odd that some of the sunniest states, like Florida, aren’t making better use of solar power energy. Further perusal of solar power prevalence will indicate that states like New York, and Connecticut, that have less sun seem to be using solar power much more. This is because the prevalence of solar power energy systems is not based on the amount of sun available but instead is impacted by the rules and regulations created by public utility commissions and at the state level. In states with mandates that favor solar power, it is more accessible for all. In many states, there is a state mandated target for the percentage of electricity that must come from renewable, clean sources like solar power versus “dirty” fossil fueled sources. This state mandate “motivates” public utility companies to encourage residents to switch to solar panels. Although Virginia passed a voluntary RPS target in 2007 of 15% of base sales by 2025, it’s not enforced by any penalty for failure and so it’s just not as compelling as a state mandate. Their voluntary RPS is also missing a solar carve out so although there have been steps in this direction, a solar carve out would certainly result in more solid encouragement for residents to switch to solar power. If and when Virginia’s state legislature feels compelled to transform their voluntary RPS goals into a state mandated RPS enforced by penalties and fees for failure to meet targets, utilities will enact programs to encourage residents to transition to solar power. This has been true in other states, and it’s certain to work the same way in Virginia. 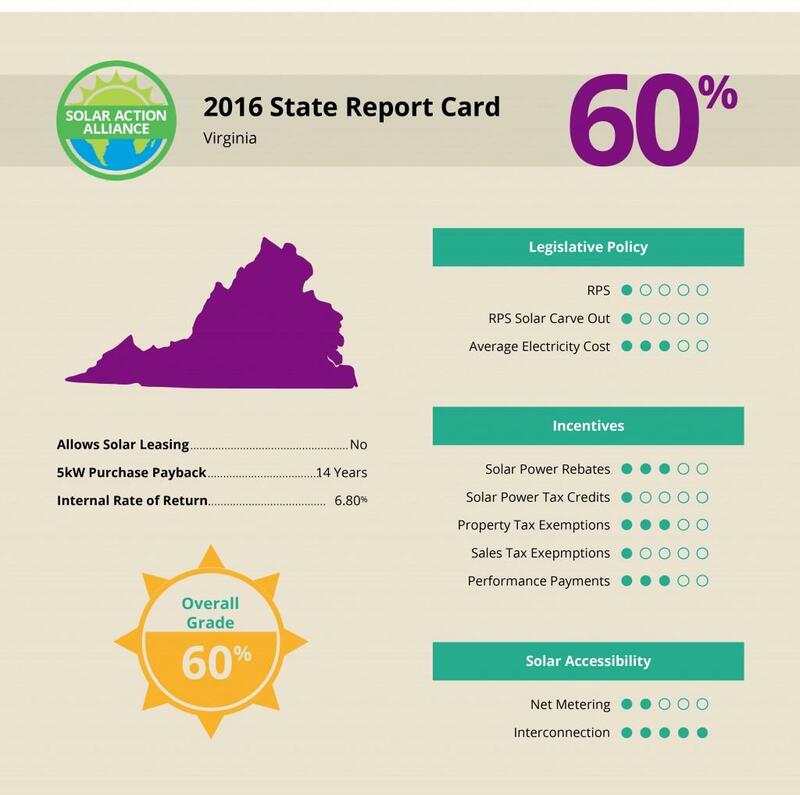 When it comes to the 2016 Solar Report Card which grades states in each of ten different categories and then provides an overall grade, Virginia gets a disappointing D. It ranks 35th in the nation for solar power. Most of its poor grade is due to having only a voluntary RPS with no solar carve out and no state tax credits or sales tax exemption. Virginia is the 25th highest for electricity rates which means the potential for savings with solar power is definitely there. Virginia does have some average solar policies for things such as Rebates, Performance payments, and property tax exemption and a very good interconnection policy. It seems to have solid potential for statewide solar policy, but Virginia’s lawmakers need to do better. 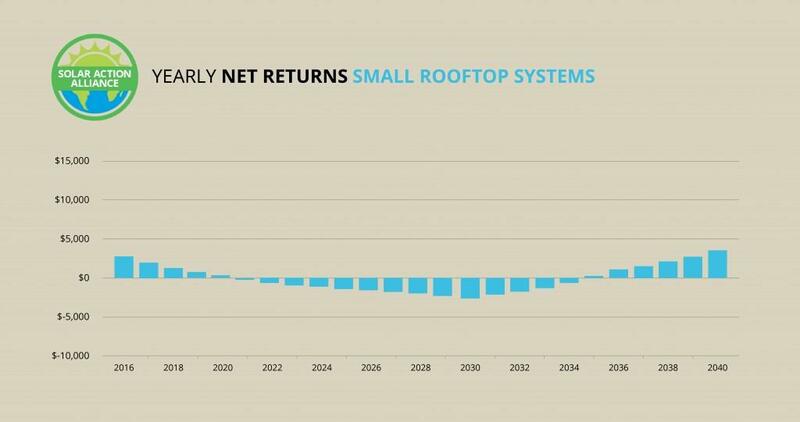 Payback time on a 5kW solar energy system is 14 years with a return rate of 6.8% internally. It’s still worth the switch to solar in Virginia, but the addition of state incentives and a stronger RPS and improved net metering policy will make this an even better deal.